Limited edition blue vinyl LP & collector's edition CD! 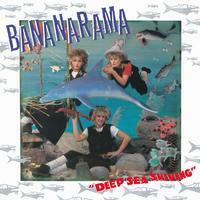 Bananarama burst onto the pop scene in 1983 with their debut album Deep Sea Skiving. With a DIY punk attitude and bags of charm the band soon became a mainstay of TOTPs, Smash Hits, the NME and The Face. Deep Sea Skiving contained the first of their string of immaculate, self-penned, ramshackle, charmingly naive pop gemstones. The album includes five hit singles: "Shy Boy," "Really Saying Something," "Cheers Then," "Aie-A- Mwana," and "Na Na Hey Hey (Kiss Him Goodbye)." Bananarama are often cited as the U.K.’s most successful ever girl group with five U.K. singles and 10 top 10's. They were the girl group that defined the 1980s with their run of pop hits which soundtracked the lives of fans around the world.